Dublin Airport was the 11th largest airport in the European Union last year, new data from Airports Council International (ACI) Europe revealed. Dublin Airport handled almost 31.5 million passengers last year, making it the 11th largest airport within the European Union and the 15th largest airport in Europe. 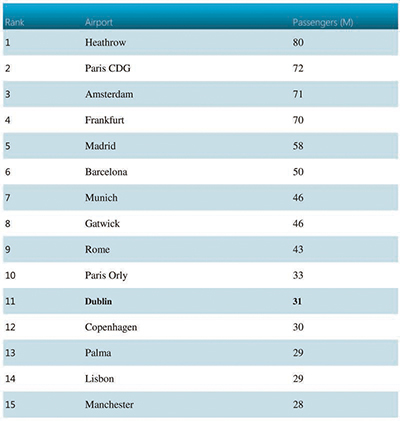 Frankfurt achieved the highest growth among the major airports (up 7.8pc), with 69.51m passengers. The soon-to-close Istanbul-Atatürk posted the second best performance (6.4pc), with 68.19m passengers). Paris-CDG was up 4pc, with 72.22m, but strikes at the home-based network carrier took their toll, while capacity constraints more than halved growth at Amsterdam-Schiphol (3.7pc compared to 7.7pc in 2017), with 71.05m passengers, and also limited gains at Heathrow (up 2.7pc), which remained the busiest airport in Europe, with 80.12m passengers. The new statistics by ACI Europe also show that Dublin Airport was one of the fastest-growing large airports in Europe in the second half of last year. Passenger traffic at Dublin increased by 6.7pc between July and December, making it the fifth fastest-growing large airport in Europe during this period. Since 2014, passenger numbers at Dublin Airport have increased by 45pc from 21.7m to 31.5m. ACI Europe’s data shows that total European passenger traffic increased by 6.1pc to a record 2.34bn last year. Europe’s airports handled an extra 136.6m passengers during the year while freight traffic increased by only 1.8pc during the year. ACI Europe said that EU passenger growth was affected by air traffic disruptions, airline strikes and some consolidation activity during the summer, but that growth had improved during the winter. Airports in eastern and southern parts of the EU had the best passenger performance last year, along with those in Austria and Luxembourg. The weakest performing countries were Sweden, which has a new aviation tax, and Britain, where fears in relation to Brexit had an impact, according to ACI.